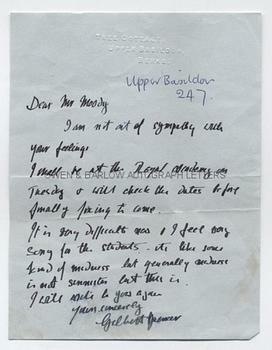 GILBERT SPENCER R.A. Autograph Letter Signed. English painter of landscapes, portraits and murals. ALS. 1p. Tree cottage, Upper Basildon, Berks [No date]. To [Victor Hume] Moody. The sinister madness of the Royal Academy. "I am not out of sympathy with your feelings. I will be at the Royal Academy on Tuesday and will check the dates before finally fixing to come. It is very difficult now and I feel very sorry for the students - it's like some kind of madness but generally madness is not sinister but this is. I will write to you again." Gilbert Spencer's telephone number (Upper Basildon 247) added in another hand. 8vo. Approx 7 x 5.5 inches. VG. From the studio archive of the Malvern artists Victor Hume Moody and his daughter Catherine. V.H. Moody was principal of the Malvern School of Art 1935-1962, in which post he was succeeded by his daughter. He is sometimes known as "the last classicist painter" and he and his daughter were opposed to the onset of modernism in art. This was a view that, to a large extent, was shared by Gilbert Spencer. The modernist movement had so infiltrated the Royal Academy of Art that drawing and figurative techniques were no longer considered necessary skills for an artist and the traditional life classes for studies of the human figure had all but disappeared. Several prominent Royal Acadamicians were later to resign including the Moodys' friend, John Ward. This is probably the sinister (which Gilbert Spencer spells as "sinnister") madness to which his letter refers.